Being in possession of all the facts before committing to any major business investment is critical and investing in broadband is no different as this cautionary tale shows. A recent study of broadband services in a rural area of England, involving both a mapping study and a survey of businesses, threw up a fascinating insight into the problem of developing a clear understanding of demand and availability. The name of the area will remain anonymous but it could have been of any number of communities. The received wisdom in this area was that a number of small towns were poorly served by broadband and the survey of local businesses largely supported this view. However it was strongly contradicted by the mapping exercise which suggested quite the opposite. In an attempt to reconcile the difference it was much easier to check the cold, hard data than to suggest to businesses that they might be mistaken, so the logic of the data was re-evaluated. As further checks, line tests were carried out on each of the businesses lines, and a software speed checker was used to test the existing business broadband services. Both of these checks further corroborated the data. 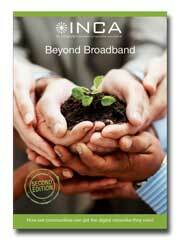 There remained little scope to support the business community’s belief that they were poorly served by broadband. So what was going on? A theory was developed along these lines: Defined market towns tend to build up their own support structures which can lead to the community becoming reliant on a narrow and possibly isolated pool of expert advice; the more esoteric and scarce the skill, the greater the scope for that advice to be of less than the highest quality. In this environment a respected opinion can become the received wisdom and a local mythology can easily develop. This mythology can then be readily propagated and perpetuated in a tight-knit, well-structured community. Contrast this with more sparsely populated areas where people tend to travel further to plug into support networks and different people may seek support in different directions. This is likely to create a richer, more diverse advice network where myths are more readily challenged. More sparsely populated communities are perhaps also more accepting of poorer infrastructure, and may have less effective communication channels. As a result, sparsely populated rural areas – relative to small towns – may under report their broadband problems. As the shape of the digital divide hardens, with the most densely populated urban areas seeing some form of superfast broadband investment while other areas remain largely as they are, the debate is increasingly becoming emotive. And this can make it harder to understand the business case for investing in broadband. The lesson to take away from this case study is that, while the narrative of communities is important in developing a business case for broadband, it should mainly be used to add colour and to personalise cold, empirical data. The description of the problem should be based on facts, while the narrative gives voice to the kinds of services the community may demand.